Super realistic cushions - pillows imitation of marine life and sea fish, made with polyester fiberfill, durable and very soft, washable at 40 degrees. A very suitable gift for both adults and children. They can be used also as a cushion or pillow. Produced in Europe, meet all quality requirements of the European Community. The Ocellaris Clownfish (Amphiprion ocellaris) is a small marine fish, recognizable by its characteristic color pattern. It is endemic to the shallow reefs of the East Indian and Western Pacific Oceans. 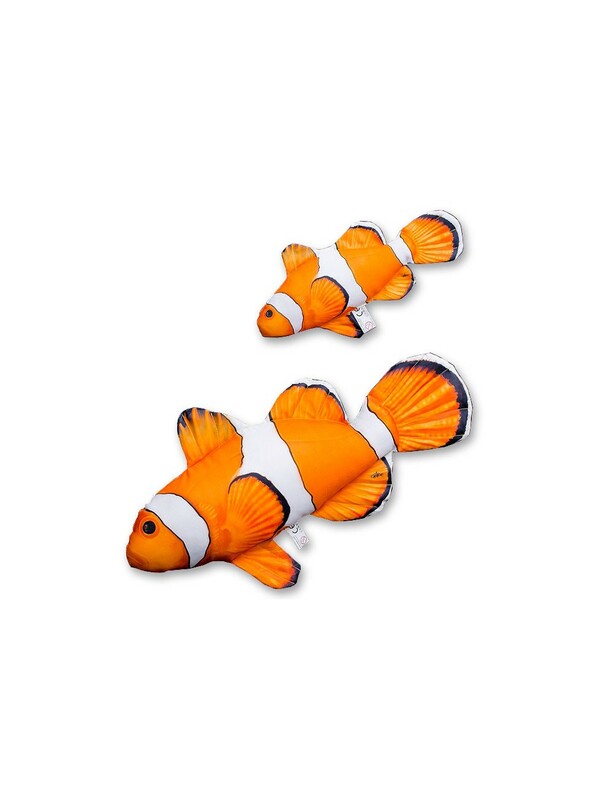 Clownfish live in symbiosis with anemones, whose arms can be deadly to other fish. The reproductive cycle of the clownfish is linked to the moon’s phases and can see the clownfish reproduce several times a year. The species feeds mainly on algaes and plankton as well as food particles left behind by its anemone host. It is a very popular saltwater aquarium fish. Show to the smallest of home the species you can see when you are diving! It will be a fantastic gift and fun while kid learns. 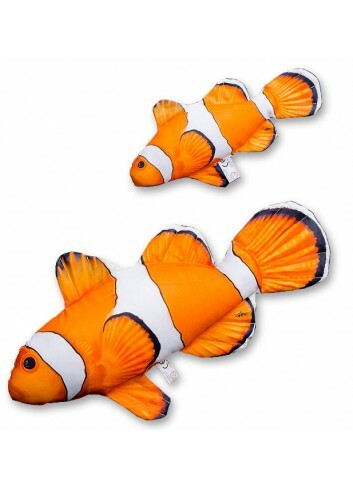 gaby clownfish cushion: Super realistic cushions - pillows imitation of marine life and sea fish, made with polyester fiberfill, durable and very soft, washable at 40 degrees. A very suitable gift for both adults and children. They can be used also as a cushion or pillow. Produced in Europe, meet all quality requirements of the European Community.